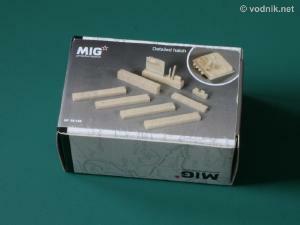 Small resin detail set from MIG Productions is designed for Dragon's T-34/76 1940 & 1941 models in 1/35 scale. The set comes in a small cardboard box and parts are packed in a single plastic zip-bag inside. 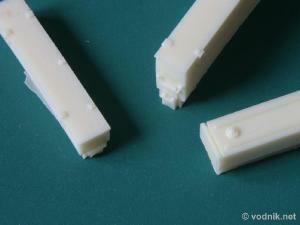 There are some styrofoam chips added in the box, to protect resin parts from damage. No instructions are provided other than two photos on the box labels. One photo shows all resin parts attached to Dragon kit hull and the other photo shows them loose with resin pouring blocks removed. 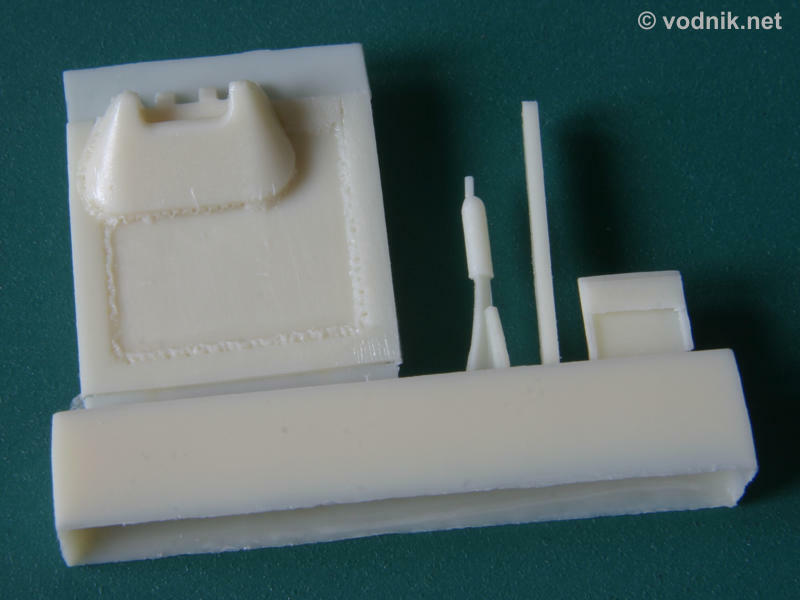 Parts for the driver's hatch are shown assembled, but the picture is not very clear so some guessing or good reference pictures are needed to correctly attach detail pieces. 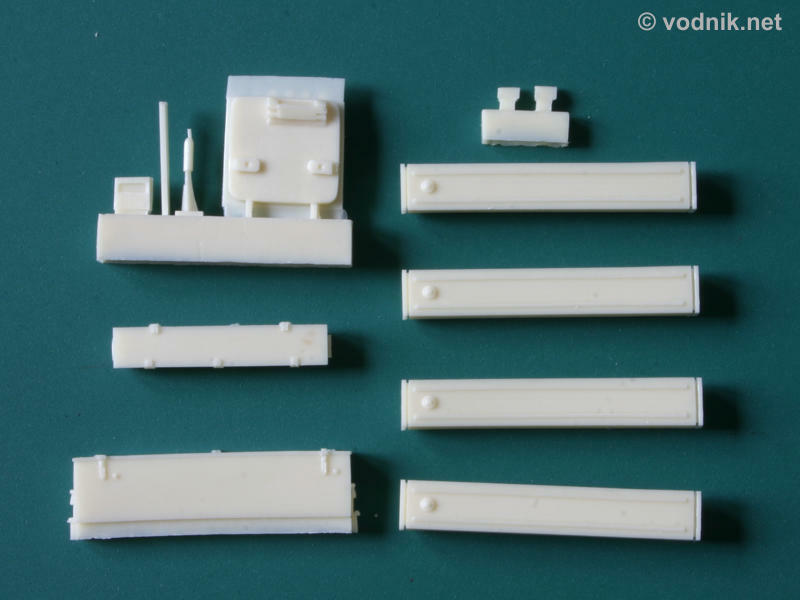 The set contains eleven resin parts: four box-shaped external fuel tanks, two storage boxes - one small and one large, two small driver's periscopes and driver's hatch with two additional detail parts for the bottom side of it. Molding quality is very high, with no air bubbles and no flash. Details on parts are very crisp. Drivers hatch features realistically looking weld seams on it and storage boxes have nice hinge and clasp details molded on. Driver's hatch is deliberately molded with excess thin resin plate around hatch hinges. This excess resin can be very easily removed and its presence insures that all hatch details are fully molded. Resin pouring blocks are of typical size for resin parts and will require the use of razor saw and/or sandpaper to remove. I don't know much about WW2 armor, particularly Russian, so will not even try to comment on accuracy of parts. MIG Productions on their website claim that fuel tank and driver's hatch parts in their set replace inaccurate parts in Dragon's kit - I have not seen kit parts, so I can only trust their words on it. Storage boxes are provided as additional detail, used on some tanks. Dimensions of fuel tanks are: 38 mm x 6 mm x 3.7 mm (L x W x H). Dimensions of storage boxes: smaller 27.5 mm x 5.2 mm x 3.3 mm and larger 35.6 mm x 5.2 mm x 8.3 mm. Click on picture to enlarge it. Close-up shot of driver's hatch details. On the left and in the center are storage boxes and on the right is a fuel tank. As far as I know Dragon T-34 kits do not really require a lot of corrections as they are already very good and accurate. 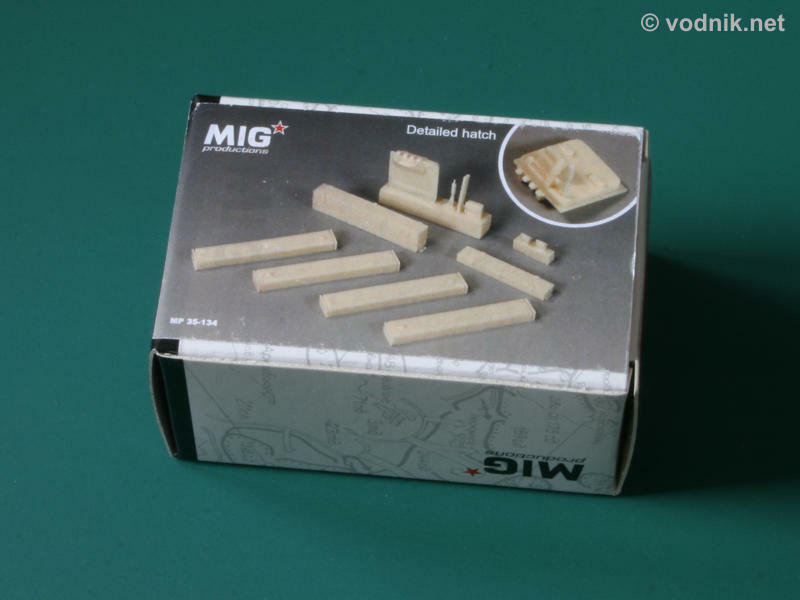 MIG Production set indeed is not large and contains just a few parts, which replace kit parts considered by set designers to be most inaccurate. This set will not dramatically change the appearance of Dragon model, but I'm sure it can add a little more accurate detail and this makes it worth recommendation.